The grocery store delivered and now we have fresh mint! So, to celebrate I made us some French Pearls (gin, mint, simple syrup and Pernod). I still am a little too violent with my muddling as you can see from the flecks of mint, but I am working hard to improve. Little by little, practice makes perfect. Of course this will only last as long as my supply of lemon and lime juice lasts. Remember all that powdered lemon and lime peel, well; what did you think that I did with the juice? I froze it into nice little usable portions that all melted into one usable portion on the way over here. On the downside, the grocery store sent us cilantro instead of parsley, and flat water instead of Pelligrino. The very nice customer service representative explained that most people don’t really know the difference. I kid you not. 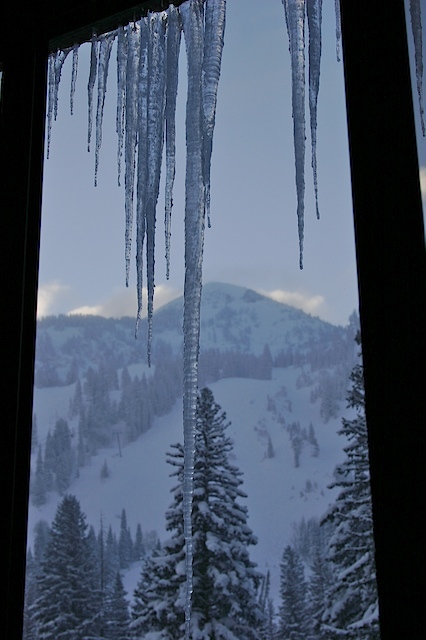 And here’s the morning mountain update: We woke up to some nice icicles, it’s stopped snowing although there is more in the forecast for later today and tomorrow. The powder skiing yesterday was outrageous, face shots, over the head plumes, yeah, it was that good. Muddle lightly simple and mint sprig. Shake and double strain for the perfect elixer. I’ve been making some wonderful hot toddies…1 tsp. demmara sugar or simple syrup. 1 tsp. lemon juice. 1 oz. brandy, cognac, bourbon or rum. Stir in a mug, and top with about 4 -5 oz. boiling water – lemon peel garnish. Nutmeg works. Yes, Yes there is lime juice! Oops!! Your hot toddies sound excellent and would fit the bill on a very cold, windy, snowy day. Mitch, what can I do with Orange Bitters? I’m looking for inspiration. Stir on cracked ice till really cold. Strain – garnish with a lemon twist. Possibly the original martini. 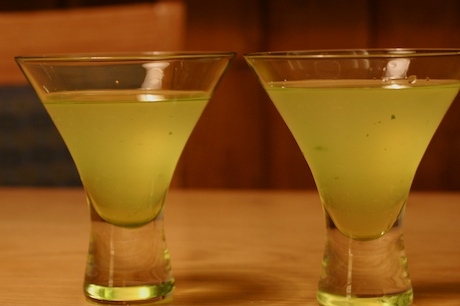 Of course you can add them to a martini as we know it today, 4 or 5 or 6 parts gin to 1 part dry vermouth – couple of dashes orange bitters, stirred, etc. Garnish with a lemon twist or a real Maraska cherry!